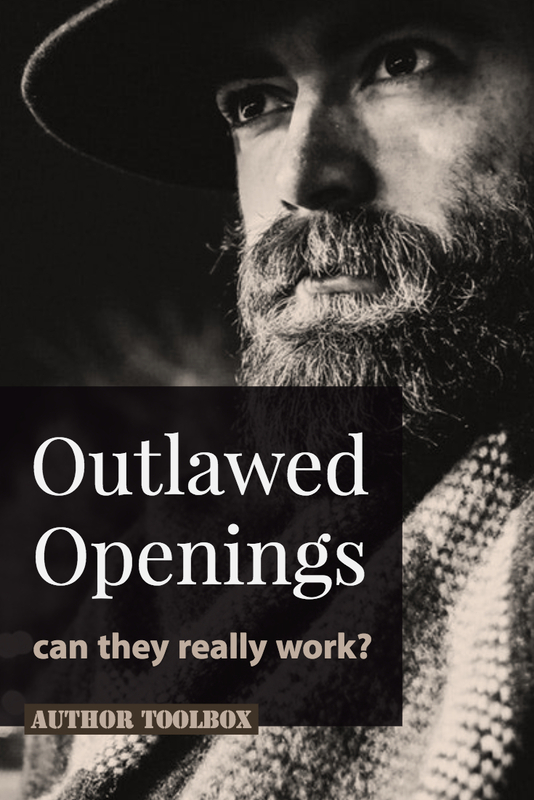 CAn you make an outlawed opening work? Most writing advice blogs will tell you to never use dreams, flashbacks, or waking up to begin your story. Avoiding these outlawed openings are often the first piece of advice given out at “pages or pass” readings during any writer’s conference. There are posts all over Pinterest warning writers to stay away and with good reason. These types of openings are all too common and they almost always fail. The simple truth is that anything can be made into a compelling opening if done right. (The Hunger Games begins with Katniss waking up.) The difficultly is making these types of openings compelling. If you believe this memory is the most effective means of introducing your story, then you have your answer. My best advice is to proceed with caution. The reason most “waking up” story beginnings fail is the lack of a defined purpose. The author choose to begin there because she didn’t know where else to begin. Novels need to start at the beginning of the story; therefore, the memory must have a clearly defined purpose for introducing it. In other words, why does the reader need to know this right now? By choosing to defy the convention of “starting the story with action,” then you need to be able to justify this choice. “Because I wanted it there,” doesn’t cut it. No one cares about your elaborate world-building on page 1. No one cares about your character’s unrelated childhood tragedy. If you are putting a dream or memory sequence at the beginning of your story just to explain something to the reader, it will fail to engage her. It must lay the foundation for the rest of the story. That means that the rest of the book must be framed around /altered by whatever profound thing is revealed in the memory. By choosing to introduce your story with this memory, then it should affect everything that happens. To test this, try taking the memory away, if it changes how the reader will perceive what follows, then you know the information revealed is critical. The opening is the introduction, the foundation for the entire story. This sets up the expectation that everything after will match. If you break this convention, your will annoy your readers. The reader will assume that whatever happens in the opening sequence is the beginning of the real story. If you start with a dream, or a memory, the reader will feel duped and left to wonder if anything she just read is even pertinent to what follows. Readers do not like being tricked. Never begin your story with this intention. It isn’t clever. It’s an invitation to the reader to close** your book. It must either set up an important question or cause the reader to make an emotional connection with the character. Often these types of openings fail as a hook because they reveal the answer, rather than posing a question. The opening must create more questions than it answers. This leaves the reader wanting more. Trying for the emotional hook usually fails because slapping the reader with a sob story on page one comes across as a cheap ploy. Until the reader is invested in character, she won’t care about her ugly backstory. This is difficult to do in an opening. Readers want to connect with the character’s current situation, then they will want to learn about her backstory. Assuming your opening meets these criteria and you have decided to proceed, make this opening brief so the real story can begin right away. Genre also makes a difference. You will get more license for philosophical openings in women’s fiction than in urban fantasy, but not always. Voice matters. If the voice is engaging, readers will forgive anything. Find a book where you thought this technique worked, and study this example. Then, incorporate those same ideas into your opening. And finally, make sure you get feedback from your beta readers. These openings are discouraged for good reason. Making them work requires advanced writing skills. You may think you have accomplished your goals, but a reader may disagree. While most writing advice blogs will tell you to avoid these types of openings, nothing about writing is absolute. There will always be people who find a way to break the “rules” and these are the writers people remember. If you found this article useful, please share it with other writers on social media, or pin the image below Thanks! The next chapter jumps back to her earliest memory in life, when she was three years old and is badly burned while cooking hot dogs on a propane stove, because her mother can’t be bothered to feed her children. From this point on, Jeannette Walls’ memoir continues in a straight timeline through her childhood and early adulthood until the end of the book, when she is back where the story started, all grown up and living in NYC, worried and frustrated by her irresponsible mother. Is this what you mean by starting with a memory? This sounds like a good example. Thanks for sharing! Ok, I was wondering. Because I am thinking of starting my memoir, Growing Up Crazy, with an event that happened in May 2000, when my then-husband and I were filmed for one of Oprah Winfrey’s inspirational “Remembering Your Spirit” segments. After several hours of being followed by a professional film crew everywhere we went, feeling like we were King and Queen for the day, with cameras recording our every move as we walked hand in hand along a riverbank, strolled through a covered bridge, and shared a romantic candlelight dinner in our favorite restaurant — at the end of the day, less than fifteen minutes after the film crew had packed up their equipment and driven away, my husband turned to me and made a confession that destroyed our marriage. Some time later, after throwing my wedding ring into the river from that same covered bridge, I got into therapy, where I sorted through my earliest memories and began to unravel why my life had taken so many wrong turns. So — my idea is to begin my first chapter with me as a forty-something adult being filmed for Oprah, and in the second chapter I am two years old, waking up in my crib in northern California to a 6.7 earthquake — my first clear memory — which basically sets the theme for my entire crazy childhood. I have read a lot of writing books and blogs, and a large number of memoirs. The advice I kept coming across was never to start a book with waking up, or with a memory flashback. But the memoir I am writing does both of these things in life the first two chapters, because I really was asleep when the earthquake hit and woke me up! After reading all the advice about how NOT to start a book, I did not know what to do. When I read The Glass Castle, though, I thought that maybe my story will work the way I have it. What do you think? Do you like my idea of starting off with being on the Oprah Show as an adult, then flashing back to waking up to an earthquake in my baby crib at the age of two, and going forward from there? Or do you think I should do my story differently? After all, it’s not like I expect Oprah to choose my book for her club, especially considering that the beautiful segment she had on her show of my inspirational “happy marriage” turned out to be a sham… although I honestly did not know that until after the film crew left! My former husband actually called the producer we were working with and asked her not to air the segment, explaining that I was leaving him (because of his very hurtful confession, which he failed to mention.) But the producer explained that we had signed releases, and that a great deal of money had been spent on filming and editing our segment, and so it did air on May 20, 2000. Oprah introduced our segment by saying: “And next we have Linda, who “SAYS” that her marriage has never been better… ” with a heavy emphasis on the word “SAYS.” So, yeah, I am not looking for any help there! It was such a shock, feeling like I was on top of the world, being filmed for the Oprah Show… it was better than winning a mega bucks lottery, I am sure! And then my husband shot me back down to earth like a punctured hot air balloon before the day was over. Our marriage ending ultimately turned out to be the best thing that could have happened. But, it sure didn’t feel like that at the time! Wow I can’t imagine. What a shock that must have been. As for your question, I can’t really make a recommendation without seeing the pages. These types of openings aren’t usually encouraged because they are so difficult to do well. This means that each one that works is the exception, rather than the rule. My best advice is to get reader feedback to see if you’ve succeeded. I am sorry that my last comment is so long. I did not realize until after it posted. No doubt, you have far better things to do than wade through my wordy mess. I’m having one of those days where I am writing blog comments instead of my work in progress. Gotta stop this! No worries. I was camping this weekend so I didn’t have good cell reception. Sorry it too so long to respond. I’m solidly in the “start with action” camp. That said, I did begin one book with a dream, but it was part of the plot. Ghosts manipulated her during her dreams. Part of her journey was determining her reality to that which was fed to her and, in the end, manipulating the manipulators. Most of the time starting with action is the right choice! Great advice here. These prohibitions are based on some underlying concepts that you identify well here (“Because I want to” is a horrible justification for including any plot point in a story, as is info dumping and world-building; the beginning must lay the foundation and be consistent with the voice of the rest of the story). It’s those underlying concepts that matter more than the prohibitions. One of the winners during the first run of RevPit started his book with a wake-up scene, but it was a doozy, and I really liked it. There was a gnawing in my brain (“This isn’t right! This isn’t right! ), but it really did work. He didn’t wake up in a bed, but rather in a back alley, and his prose was really punchy. Another “outlawed opening” (great phrase, by the way!) is your character describing herself in the mirror. Yet Divergent starts with exactly that—and it works because we immediately realise the protagonist only gets to see her face in the mirror every few months, not every day like most of us. That’s different, and sets up a world that’s different from ours and therefore compelling. On the dream opening … people have raved to me about the movie Inception. But I can’t get into it, because it’s a dream within a dream (within a dream? I don’t know. It had already lost me). I guess the lesson there is that even if you break the rules well, it won’t work for everyone. Great advice. I think the message I’m getting is that if you’re going to do this, make sure you know how to do it well.